Today I want to share with you a couple of Thank You cards I made. I made several Thank you cards that I will be sharing with you over the next little while. While they are all pretty simple, I think they turned out to be very cute! These were part of a gift that I sent to my best friend, Debbie. For these cards, I started with Kraft cardstock for the base of them. Then I went through all of my paper scraps and pulled out the papers that I thought would work. I also pulled out a few different ink pads. I started cutting and gluing and embellishing with ribbon, brads, flowers, etc. as I went. It’s hard to tell in the picture, but this second one, the pink piece of paper is lifted off of the card. I love adding dimension in this way. Like I said, they are simple, but cute cards. Have you made any cards lately? These are beautiful! I love simple and colorful cards. I used to be in a card club and loved making them. I’m starting to run out now, maybe I should get the club together again. I love these cards. 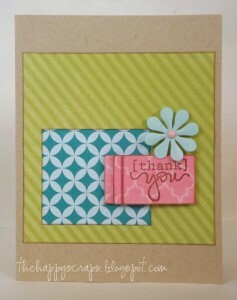 I really like using Kraft cardstock for cards. It seems to make all the other elements stand out. Love those cards, Amy! I seem to be drawn to simple cards, and that’s usually what I end up making. I’m pinning these to try later! These cards are so cute Amy! Great job! So cute!!! Makes me want to get my stuff out and stamp a little or a lot! Cute cards…you need to do another card exchange!